The nose contains three pairs of turbinates (inferior, middle and superior), elongated structures that are responsible for humidifying the air that moves through your nose while filtering dust and dirt. The lowest pair, the inferior turbinate, can cause obstruction of air when swollen, leading to breathing difficulties. Some patients benefit from a surgical procedure to reduce the size of the inferior turbinate. The inferior turbinate frequently changes size, growing larger when a cold or virus causes congestion and shrinking when treated with decongestants. It causes an airway obstruction when enlarged, leading to congestion and breathing difficulties. Inferior turbinate hypertrophy is a condition in which the turbinate has become enlarged. There are a number of factors that can cause this, including allergies, vasomotor rhinitis and deviated septum. Often, treating the underlying condition will take care of the problem. In some cases, the inferior turbinate remains enlarged despite medical treatment. Those patients often require surgery. An inferior turbinate reduction is a surgical procedure designed to reduce the size of the inferior turbinate, clearing up the airway to eliminate any associated breathing or sinus problems. 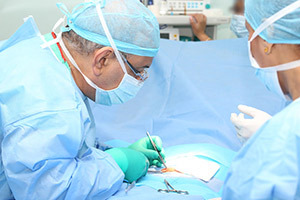 There are several different procedures that can be performed. A submucous resection involves removing a thin section of bone, causing the lining of the turbinate to shrink and the nasal passage to grow larger. This is usually performed in an operating room under general anesthesia. Radiofrequency inferior turbinate reduction utilizes a probe that delivers radiofrequency energy to heat the tissues beneath the surface of the inferior turbinates, decreasing their size. This procedure is quick and painless, and is typically performed on an outpatient basis without anesthesia or sedation. Your ENT specialist can determine which procedure will work best for you. Sometimes, a combination of techniques offers the best result.